On June 30, Washington Nationals ace Stephen Strasburg had his shortest outing of the season, lasting only three innings against the Atlanta Braves at Turner Field. What knocked him out of the box? The 24-year-old All Star pitcher had prepared by drinking copious amounts of water the night before. He retreated to the air-conditioned clubhouse between innings. No matter. The temperature at 4 p.m. game time that Saturday afternoon was 104 degrees, the official high that day was 106 -- the hottest in Atlanta's history -- and by the fourth inning the temperature on the field was around 120. It wore Strasburg down. By the second inning, his uniform was soaked with sweat. He was dizzy, his face was pale, his breathing, labored. He could hardly respond to questions from his pitching coach. He later told reporters that he "didn't know what was going on." After he left the game, team trainers gave Strasburg three intravenous saline transfusions. Fortunately he was back to normal the next day. 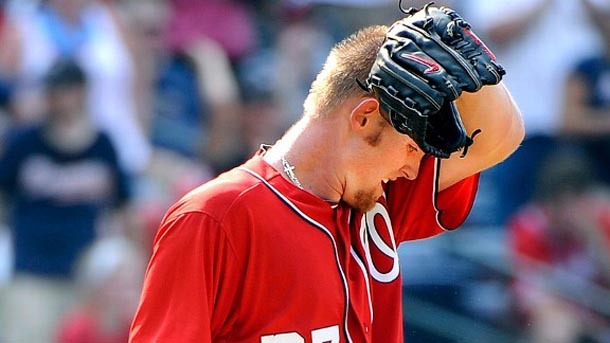 "Obviously I want to go out there and compete and I expected more of myself," Strasburg told reporters. "By no means was I going out there thinking I wasn't prepared for it. I did everything I could to be ready as far as hydrating and everything. I've just got to learn from it." Strasburg isn't the only one who has to learn from it. For years, climate scientists have been warning that dangerous heat waves -- as well as prolonged droughts -- are likely to become more common, especially if we don't dramatically reduce carbon pollution. According to a new report by the Union of Concerned Scientists (UCS), it's beginning to look like the future is now. The report, "Heat in the Heartland," found that the number of hot, humid days in Cincinnati, Chicago, Detroit, Minneapolis and St. Louis -- all Major League Baseball (MLB) towns -- have increased over the last half century. The number of summer heat waves--three or more consecutive days of scorching heat--also increased in all of those cities except Cincinnati. Although the report only looks at one region, its findings are consistent with those of a report released in June by Climate Central that found over the last 100 years average temperatures have gone up across the entire continental United States. This summer's June to July heat wave finally began to subside by the weekend of July 7 and 8, but not before breaking thousands of temperature records nationwide. From June 7 to July 7, nearly 7,700 high temperature records were set or tied. From July 1 through 6 alone, 1,916 daily record high temperatures were broken or tied, along with 1,034 records for warmest overnight lows. On top of that, this recent heat wave came at the end of the hottest first six months in a calendar year for the continental United States, according to the National Oceanic and Atmospheric Administration. The 12 months between June 2011 and this June were the warmest since modern recordkeeping began in 1895. And July turned out to be the hottest month on record. What does this trend mean for the national pastime? Could extreme heat and humidity lead to more injuries, or fewer fans in the stands? Let's take a look at how baseball is coping with high heat. Putting on the Shvitz. There's a reason why they call the town Hotlanta. The daily high temperatures during the three-game series between the Nats and the Braves in late June and early July all set new records. On June 29, the day before Strasburg's early exit, the thermometer hit 104 degrees. The day after, it was 105. But the Nats and the Braves weren't the only MLB teams that endured that hot spell. It was just as bad or worse for the teams in the Midwest cities reviewed in the new UCS report. The Chicago White Sox played two three-game series at home between July 3 and 8 against the Rangers and the Blue Jays. On July 3, the high was 96. On July 4, it was 102, tying the city record. The next two days the temperature hit 103, both records. On July 7 it finally cooled down -- to 98. The St. Louis Cardinals, meanwhile, played a steamy home stand against the Pirates, Rockies and Marlins between June 29 and July 8. Temperatures during that 10-day span broke six records and ranged from 98 to 108. Nine out of the 10 days were over 100. Besides Strasburg's meltdown, the Sports Network baseball injuries list between June 25 and July 8 indicated that other MLB players soldiered through without any heat-related incidents. That's likely due to the fact that teams have taken a number of steps over the years to protect their players. The Minnesota Twins, for example, had to switch gears in 2010 when they moved to Target Field, a new, open air stadium. From 1982 through 2009, the team played half their games in the enclosed Metrodome, where the temperature hovered between 68 and 72. From June 29 through July 1, the Twins played at home with temperatures in the low- to mid-90s. They were traveling the following week when Minneapolis temperatures jumped as high as 102, but the team didn't escape the heat. They had to play in Arlington, Texas, against the Rangers, and in Detroit, where the mercury hit a record 102 on July 4. I asked Rick McWane, the Twins' head athletic trainer, what he does to get his players ready for games. His answer was typical of what other teams told me. "We concentrate on proper nutrition and pre-hydrating," he said. "We encourage the players to drink plenty of fluids and use ice towels. And we monitor the players' weight before and after the games, and occasionally give them IV fluids." Teams also have installed water-misting fans in their dugouts and encourage players to step inside their air-conditioned clubhouses between innings. Hydration is key to avoiding injuries, said Michael Bergeron, executive director of the Indianapolis-based National Youth Sports & Safety Institute. "Players have to prepare more deliberately. Most don't hydrate as optimally as they should. They tend to be chronically dehydrated. In less stressful heat they can get away with that. But if they have a fluid deficit at the beginning, when it is really hot and they are going for a long time ... the heat stress will reveal their shortcomings." Players also have to pay more attention to how many hours of sleep they get and what they eat, said Bergeron, who has a doctorate in applied physiology. They may need more carbohydrates in their pregame meal, warm up less before the game, and eat more carbs and guzzle more water or water-electrolyte drinks during a game. Pitchers are the most susceptible to the heat because they exert the most energy on the diamond, he said, but all players are vulnerable. And the impact of oppressive heat and humidity may be subtler than full-blown heat exhaustion. "Just being a little dehydrated can change your timing, your reaction time, your cognitive ability," Bergeron said. For example, it could make it more difficult for a batter to track a pitch, or for a pitcher to decide what to throw. Stan Conte, the Los Angeles Dodgers' senior medical services director, published a paper earlier this year in the American Journal of Sports Medicine on the recent spike of abdominal muscle strains among baseball players. He agrees that dehydration is a big problem and plans to investigate the correlation between baseball injuries and extreme heat and humidity. Although team trainers discourage caffeine consumption, it may be an issue, said Conte, who has a doctorate in physical therapy. "It's a long season. What are players using for energy to play games almost daily?" Now that there is stricter drug testing, he said, amphetamines are verboten and players may now be relying more on caffeine-laced energy drinks. Baked Beanballs. It turns out that hotter temperatures also have an effect on baseball's unofficial eye-for-an-eye beanball rule. It goes like this: If your pitcher plunks one of my batters, my pitcher is going to respond in kind. According to Richard Larrick, a social psychologist, it happens more often when the mercury rises. That could lead to more injuries, too. In April 2011, Larrick and three of his colleagues at Duke University's Fuqua School of Business published a paper in the journal Psychological Science that analyzed data from more than 57,000 baseball games from 1952 to 2009, which included 4.5 million at bats. Of the approximately 190,000 at bats that happen every season, roughly 1,550 result in a pitcher hitting a batter. After factoring out such variables as wild pitches and fatigue, they superimposed game stats over weather data and found that batters had a 27 percent chance of being hit by a retaliatory pitch when the temperature topped 90 degrees, but only a 22 percent chance when temperatures dipped into the 50s. "Most of the time, the first time a pitcher hits a batter in a game, it's an accident and happens at random," explained Larrick. "There's no advantage of putting a batter on base. What changes is how the team whose player was hit responds. In hotter weather, the pitcher on the team whose player was hit is more likely to retaliate by hitting a batter on purpose." In other words, the higher the temperature, the more likely a team will interpret the first hit batter as intentional and exact revenge. Larrick said his findings are consistent with previous studies on the psychological effects of heat. "There are decades of research showing heat leads to aggression, like finding more violent crime in the summer," he said. "But in crime statistics, it's hard to really determine if it's heat or other things. One of the nice things about studying baseball is that we're able to control for factors besides heat." Wear Sunscreen. MLB teams have full-time medical professionals and trainers on staff to protect their most important asset -- their players. But what about the fans? Roasting in 100-degree heat for three hours is physically draining, regardless of how many beers you drink. The good news is not only are teams adapting to climate change to protect their players, they are providing more amenities to keep fans cool. A spot check of some of the teams in the cities surveyed in the new UCS report -- the Cardinals, Cubs, Twins and White Sox -- found that they all provide free water, cooling stations and water-misters, and have more medics on hand on hot days. Meanwhile, teams with newer stadiums -- the Cards and the Twins, in this case -- have incorporated a number of design elements, including air-conditioned clubs, restaurants and skyboxes, in their new ballparks to offer fans relief. Mid-century, multipurpose circular stadiums such as Cincinnati's Riverfront Stadium and Pittsburgh's Three Rivers Stadium were saunas in the summer, especially when they had artificial turf. Busch Memorial Stadium in St. Louis, which was demolished in 2005, was one of the first of those cookie-cutter facilities. To celebrate its inaugural season, MLB held its annual All Star Game there in July 1966. According to the Baseball Almanac, "the top story ... had nothing to do with baseball. It was the blistering 105-degree game time temperature. Spectators ... were passing out in the stands and smelling salts and oxygen were required in the dugouts. Despite these intense conditions, the game went on as scheduled, although no one wanted to spend much time on the field." After the game, a newspaper reporter asked the legendary Casey Stengel what he thought of the new stadium. "Well, I'll tell ya, young fella," Stengel replied, "it sure seems to hold the heat real good." There are more stifling days in St. Louis these days. UCS found that between 1946 and 2011, the number of extremely hot, humid summer days more than doubled from an average of six to 15, while the number of heat waves -- three or more consecutive days with high heat -- jumped from three on average every summer to seven. This summer the city has wilted through 11 days with temperatures at or above 105 degrees, the most recorded in any year, and July's average temperature was 88.1, the city's warmest on record. "It has always been hot in St. Louis in the summer," said Ron Watermon, the Cardinals' public relations director. "We've carried over our same routines from the old ballpark to the new when it comes to dealing with helping fans cope with heat -- free water, cooling stations and misting stations." What's different, he said, is the new stadium's design. Busch Stadium, which opened in 2006, is 75 percent larger than its predecessor but, with a capacity of just under 47,000, accommodates fewer fans. Most of that additional space, which made room for season-ticket-holder clubs, private suites and party rooms, "is for fan comfort," Watermon said. The design also features wider concourses, enabling fans to get out of the sun on hot days and escape the rain during rain delays. And last year, the team installed industrial-strength fans in a number of seating areas to improve airflow. Record-breaking temperatures don't appear to stop Cardinals fans from flocking to the stadium. Between June 29 and July 8, when daily highs fluctuated between 98 and 108, the lowest turnout was 37,821 on Saturday, June 30, when the mercury hit a record 105, and the biggest crowd --46,721 -- came out on Friday, July 6, when it hit a record 106. "Our fans are loyal and accustomed to hot weather," said Watermon. "It also doesn't hurt that we are reigning world champions. And we have had some great promotions that help draw fans." He said the near sell-out on July 6 was at least partly due to the fact that the team gave every fan in attendance a replica world championship ring. U.S. Cellular Field, the home of the Chicago White Sox, was built in 1991, just a year before the retro-ballpark era was initiated in Baltimore. While it doesn't have the cachet of Camden Yards or the storied Wrigley Field just 10 miles north, the Illinois Sports Facilities Authority has upgraded it over the years by adding features to keep fans comfortable. The renovations included new air-conditioned clubs and restaurants; an enclosed, air-conditioned club level concourse; and two "rain rooms" with water misters where fans can cool off when the temperature spikes. The authority also retained a quirky holdover from the old Comiskey Park: the Chicagoland Plumbing Council Shower. It was originally installed in the outfield stands in 1976 when summer temperatures were unusually high. When the old park was demolished in 1991 to make way for a parking lot for the new Comiskey Park across the street, the shower was moved to the main level of the new park, which was renamed U.S. Cellular Field in 2003. The shower is free; there's no door, so fans have to keep their clothes on; and the team does not provide towels. Some teams have gone even further to make sure they keep fans in the stands. Six of the 30 MLB ballparks now have retractable roofs, and the Tampa Bay Rays' Tropicana Field has a permanent one. The six convertible parks are the Arizona Diamondbacks' Chase Field, Houston Astros' Minute Maid Park, Miami Marlins' Marlins Park, Milwaukee Brewers' Miller Park, Seattle Mariners' Safeco Field, and Toronto Blue Jays' Rogers Centre. The roofs are there for different reasons. Seattle is famous for its rain. It's cold in Milwaukee and Toronto early in the season. Houston, Miami and Tampa have to deal with heat, humidity and the more-than-occasional rainstorm. And Phoenix not only bakes in the summer, it suffers from dust storms, which climate scientists predict will become bigger and more frequent. Just last week, the Washington Nationals played three games against the Diamondbacks at Chase Field. Fortunately the roof was closed. The temperature on August 10 and 11 hit 112 degrees. August 12's official high was a sizzling, record-breaking 115. And during the second game of the series, a dust storm gusting 25 to 40 miles per hour swept through downtown Phoenix and blew through cracks in the ballpark's walls. Baseball's Lower Carbon Diet. On top of these initiatives that protect players and fans, a number of MLB teams are cutting their carbon emissions as a part of a larger campaign to "green" baseball. Today eight teams have solar panels in their ballparks, according to The State of Sports Greening, a soon-to-be-released book by the Natural Resources Defense Council (NRDC), which began a partnership with MLB in 2006 to make the league more environmentally friendly. The Boston Red Sox were the first to go solar, installing 28 panels on a roof above the first base line in 2008. Last year the Diamondbacks partnered with Arizona Public Service, the local electric utility, to build a 17,000-foot solar canopy at Chase Field. And this year the Cardinals installed a 106-panel solar array on top of a ticket office and concession area at one of Busch Stadium's entrances. The panels will produce some 32 megawatts of energy annually. The Cards also conducted an audit in 2011 to identify ways to cut their energy consumption through efficiency measures -- the cheapest and quickest way to curb carbon emissions. According to NRDC, the team found nearly 200 cost-effective ways to reduce energy use, ranging from such simple things as turning off lights and closing doors to installing better ventilation control systems and replacing spotlights and floodlights with LED lamps, which cut electricity demand in several areas of the park by 90 percent. "This is all part of the St. Louis Cardinals' commitment to green its game," Joe Abernathy, the team's vice president for stadium operations, told NRDC. "Since the stadium opened in 2006, we're proud to say that we've been able to cut our energy use by 20 percent, ... saving up to $150,000 annually." Given that tens of thousands of fans attend each MLB game, Abernathy sees the league as an ambassador for environmental stewardship. Allen Hershkowitz, lead author of the new NRDC book, couldn't agree more. "The fact that Major League Baseball has embraced energy efficiency, renewable energy, recycling and water conservation is educating millions of fans about the importance of protecting the environment and natural resources we all depend on," Hershkowitz said. "All businesses -- not to mention the federal government -- should step up to the plate and follow baseball's lead." Elliott Negin is the director of news & commentary at the Union of Concerned Scientists. He worked for the Natural Resources Defense Council from 1999 to 2006 and led the organization's campaign to make the new Washington Nationals ballpark the first LEED-certified sports stadium in the country.